In the summer between my first and second years at Northeastern, I joined the public relations team at athenahealth, a healthcare information technology services provider. As a summer intern, my responsibilities were an exciting jumble of things: creating briefing materials for athenahealth subject matter experts for upcoming interviews and speaking engagements, contributing content for athenahealth's external corporate leadership blog, and measuring our team's performance against key goals and metrics on a monthly, quarterly, and annual basis. I remained on the team as a part-time intern while I completed my master's degree, working two days a week during the fall and three days a week in the spring. Following graduation in May 2017, I joined the team full-time as a senior analyst, and am now a public relations associate. My role is primarily devoted to the thoughtful creation of strategic and timely content, with the goal of expanding company presence and thought leadership in national and trade publications. I help to develop messaging frameworks and editorial calendars and ghostwrite thematic content for the company's C-suite leadership and other athenahealth experts. The other portion of my role revolves around increased visibility and communication, both internally and externally: fostering relationships with national reporters to seed athenahealth's aspirational and client-centric stories, collaborating with the social media team on upcoming athenahealth events and national health observances, and highlighting recent coverage across the company through a variety of internal newsletters and channels. During my time at Northeastern, I contributed to the work of the Women Writers Project, an initiative devoted to the encoding and granting access to early modern women's writing. As the project's research assistant, I independently encoded a handful of books and plays, using Text Encoding Initiative (TEI) language through the Oxygen platform to transform manuscript copies into fully digitized and systemized pieces of text. I also worked with the exhibits team to review already-encoded texts, build exhibits around these texts' histories and meanings, and encode relevant images for the texts. For my first year at Northeastern, I became involved with Signs: Journal of Women in Culture and Society, the leading international journal devoted to women's and gender studies. My time as a volunteer editorial intern was widely varied and incredibly rewarding. While my duties fell anywhere from proofreading book reviews to creating logos for digital projects, I holistically occupied an editorial space within the journal, editing manuscripts of upcoming issues and adhering to Signs's particular brand of the Chicago style guide. I'm grateful that I was able to be a part of a cultural work so influential and important. I have been able to work with more than two hundred students since I began tutoring at Northeastern in fall 2015. Through the Writing Center, I had the unique opportunity to assist with the essays, presentations, and professional writing of students across the Boston campus. From assignments for freshman core courses to cover letters for graduate programs, a wide variety of writing has passed across my table, composed by students with a range of literary styles and knowledge. I loved learning about all the aspects of writing in each of my hour-long sessions with students. In addition to tutoring, the Writing Center also offered other opportunities for students to become involved in the process of learning to love writing. We hosted One Day One Goal, a daylong write-a-thon; we invited students to participate in our Creative Writing Group; and we celebrated the National Day on Writing by asking students and faculty around campus to answer #WhyIWrite. In September 2014, I joined the staff of Onward State as a copyeditor. An entirely student-run website that concerned itself with the ins and outs of Penn State, I was excited to become as involved as I could with the university before I graduated in spring. By May 2015, I was the student life editor of the site; I was writing, editing, and publishing articles for more than 80,000 people to read. After Joe Paterno was restored his vacated wins in January 2015, a freshman writer and I, as the senior, reflected on what the decision meant for each of us and for the university. 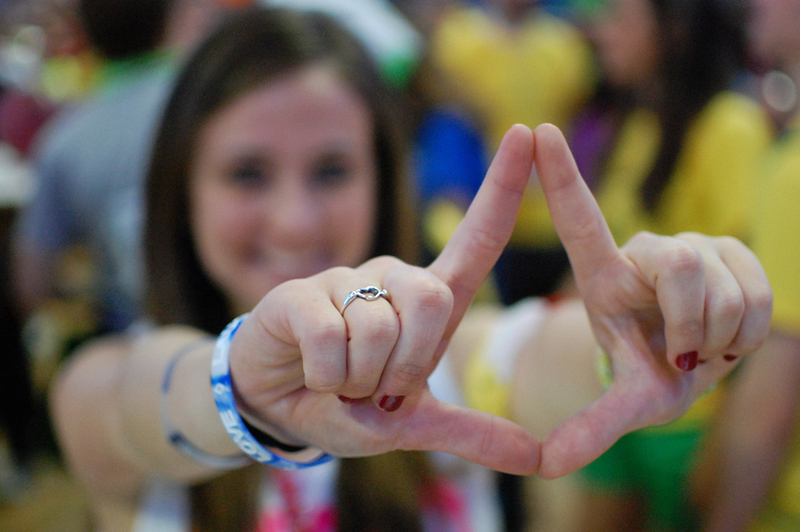 As the student life editor, I was immersed in THON, Penn State's dance marathon. This year-long student-run philanthropy, the largest in the world, culminates every February with a 46-hour dance marathon held in the Bryce Jordan Center. Although THON weekend catches the attention of a nation, the Hope Express, a 135-mile run that leads up to THON, deserves just as much recognition. In the midst of THON weekend, I took set aside time to meet with Julie, and share the story of how THON introduced her to the love of her life. This is the pride of my time with Onward State: an article that chronicles the glory days of Penn State, when fraternity members ran a 1.1-mile track that spanned six bars, while actually raising money for a good cause. Ah, the '70s. As all Onward State alums must do, I had to write a senior column upon my graduation from Penn State. And as many others do, I took the opportunity to thank those close to me, to recognize all the support I've received from my family and friends, and to reflect on the past four years of my life — all under the shadow of an Emily Dickinson quote. You can check out the archive of all my Onward State posts here. In fall 2014, I devoted time to editing and marketing for Eifrig Publishing, LLC, a publisher of children's books that spans internationally. With small homes in Lemont, PA, and Berlin, Germany, Eifrig Publishing is dedicated to spreading messages of gender and race equality, eco-friendliness, and positive self-image. While I dabbled in marketing and writing press releases, the majority of my time was spent editing manuscripts for accuracy, clarity, and style. I edited both previously released books that were looking to be re-promoted, as well as forthcoming books that were still in the creative stage. One piece that I helped to edit and polish has already been published: the first installment in The Crumbles Chronicles, a book narrated by Crumbles the dog himself. I spent summer 2014 interning with the North America division of Pearson Learning Solutions (recently renamed Pearson Higher Education). I worked in the custom publishing department as a rights and permissions editorial assistant. My days were spent proofing digital textbooks, performing QAs, and reaching out to publishers, authors, and rights holders in order to attain permission for use of images and quotations. This was my first true internship in the world of publishing, and it was a valuable lesson in the day-to-day life of an editorial assistant. Not only did I gain experience in an professional office workspace, but I also spent thirteen weeks learning hands-on communication in order to manage a rigorous and demanding publishing timeline. Weekly departmental meetings were a foundation for professional growth, and I had several supervisors to oversee my work and guide me through communication, editorial, and fee negotiation issues. By the end of the summer, I felt confident in my abilities to skillfully communicate and handle challenging editorial and rights disagreements, and had gained an appreciation for the business aspect of publishing. During the entirety of my junior year, I had the opportunity to delve into an internship with Penn State's Comparative Literature Studies department. For two semesters, I maintained the book reviews component of the department's literature journal. I contacted professors who specialized in related topics, and controlled the shipping out of books and receiving of reviews. Additionally, I copyedited some reviews.